Snow covered mountains that envelop a small valley, icicles as big as ski's, the gurgle of a steam, an ice covered lake, woodpeckers pecking, people strumming ukuleles, and the buzz of many voices. Those were some of the sights and sounds I experienced, as a participant and presenter, last weekend, at a writing retreat called Fishtrap. Fishtrap is an organization that promotes "clear thinking and good writing in and about the West." The Setting . . . The folks at Fishtrap chartered a bus that took us from Portland to Wallowa Lake, where the retreat was held. The lake is near the Northeastern Oregon/Idaho border, outside the small town of Joseph, Oregon. The bus ride was so much fun! I connected with fellow writers before the retreat started, learned how to play a ukulele, and stared at the jaw-dropping scenery. We passed ice covered trees and rocks as the bus slowly wound it’s way through the Columbia River Gorge. As the bus made it’s way out of the Gorge and toward Fossil and Pendleton I noticed an immense contrast. The landscape looked harsh, dry, and resembled a high desert, whereas the Columbia River Gorge is lush, wet, and green. When we finally got off the bus, we were confronted with cool, crisp air, and a beautiful sunset that cast a golden light on the mountains. 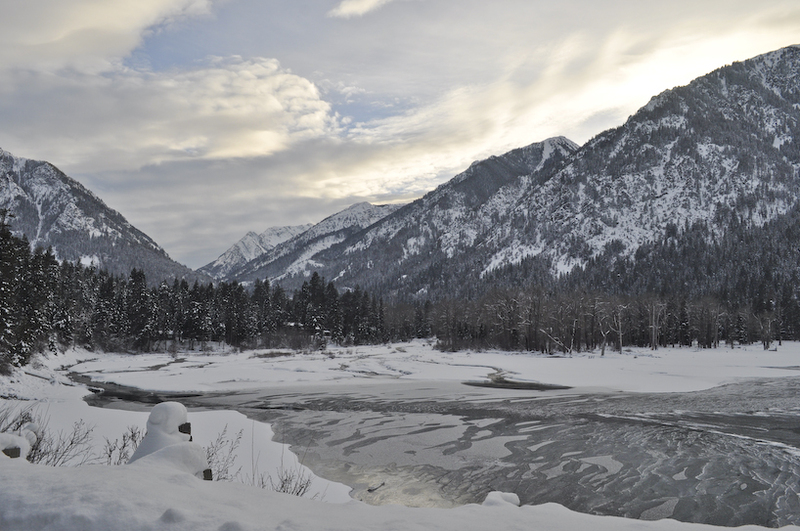 The snow on the ground was light and made crunching sounds as we walked toward the Wallowa Lake Lodge. The lodge was incredible. It was built in 1923 and it’s surrounded by mountains, huge Ponderosa pines, and cute cabins near the water. Calling the area beautiful doesn't do it justice. The setting is majestic and quiet. Getting Small was the theme of Winter Fishtrap event. The basic idea centered around writing and talking about "what it means to live smaller and more sustainably in a world mostly hell bent on bigger, faster, better." Winona LaDuke is an internationally renowned activist. She lives and works on the White Earth Reservation in northern Minnesota. In 1996 and 2000, she ran for vice president as the nominee of the Green Party, with Ralph Nader. Charles Goodrich is Director of the Spring Creek Project for Ideas, Nature and the Written Word at OSU in Corvallis, Oregon. His most recent publication is Going to Seed; a beautiful collection of poems. Be sure to check out his website. Amy Minato is a teacher, poet and the author of two books, The Wider Lens and Siesta Lane: One Cabin, No Running Water, and a Year Living Green. Kate Power and Steve Einhorn, the Ukalaliens, shared their downsizing story, along with their ukuleles and songs! The presentations, conversations, and readings were rich with detail and focused on many things related to "getting small," including connecting to community, nature, privilege, and using writing as a tool to change the world. I took away four key lessons from the retreat. 1. Be open to new experiences. When the Executive Director of Fishtrap contacted me and asked if I'd be willing to speak at the retreat, I was surprised because I've never considered myself to be a "good writer." And wasn't sure if I should say yes because speaking in public isn't my strong suit. I decided to say yes because I knew the experience would be enriching. Being open to new experiences fosters growth and creativity. And you never know who you will meet or what you'll see. One of the many highlights of the weekend included touring a tiny gypsy wagon. The woman who owned and built the wagon lived in it for three month stretches, while she worked for the United States Forest Service. Touring the wagon and chatting with the owner was serendipitous because my friend, Dee Williams, was at Fishtrap. Dee is designing our little house. So touring the wagon and chatting with the owner gave us a few design ideas. 2. Listen to people's stories and ask a lot of questions. I had the opportunity to listen to a lot of remarkable stories and ask my new friends questions about their lives. Active listening is one key to happiness because we learn by listening and asking questions. By asking a new friend questions about their life story, you are showing that you can listen and that you care about what they are saying. Before I got up to the podium to give my talk, I thought my heart was going to jump out of my chest. Thankfully, yoga has taught me to breathe deeply. As I walked up to the podium, my legs and hands were shaking and I took a deep breath. All I had to do was breathe and be myself. Remember to breath deeply if you're in a situation where you feel nervous or scared. It's one way to decrease your stress level and heart rate. 4. Don't be scared of community, embrace it. Our hyper-individualized culture has taught many of us that we don't need community, that we can do everything ourselves. That's a myth. If we're going to make positive changes in this crazy world, we have to work together. Attacking big problems from different angles is possible. For example, the folks who attended Fishtrap made up a relatively diverse group of people, who have unique interests and skills sets. Writing and reading were the things that brought us together. These commonalities facilitated community and many discussions about simplicity, sustainability, and how we can all make a difference in our own local communities. On Sunday morning I took a walk through the dry snow and took in the scenery. As I looked up at the mountains and out toward the lake, I felt small, like a tiny seed. Even though I felt small, my heart swelled with gratitude. The theme of the weekend was "Getting Small," but I walked away with fresh ideas, a new tribe of friends, and the motivation to keep growing my writing. And that is far from small, it is very big.